Trombonist Nitzan Haroz, trombonist Matthew Vaughn, Blair Bollinger on bass trombone, Philadelphia composer Jennifer Higdon, and tubist Carol Jantsch, at the Kimmel Center, Saturday, February 24, 2018. Jennifer Higdon has written another friendly piece. How much there is there? The Low Brass Concerto was premiered by the Chicago Symphony Orchestra a few weeks ago, and Thursday night in Verizon Hall the Philadelphia Orchestra gave locals their first listen (it was co-commissioned by both orchestras, along with the Baltimore Symphony Orchestra). Philadelphia has put a lot of eggs into one basket with Higdon over the years. Opera Philadelphia has staged her Cold Mountain, and this new concerto is the ninth orchestral score by her to be played by the Philadelphia Orchestra (it's the 15th if you count the chamber works performed under the orchestra's banner). It probably would be a good thing for the orchestra to diversify its living-composer lineup a bit more. The Low Brass Concerto is not unlike other Higdon scores; it's heavy on percussion, it paints from an American palette, its emotions ebb and flow in a direct, easily understood way. I liked it best when it grew lyrical in the middle portion. It is there the music seems most pure. Though Higdon provides plenty to do for the low brass soloists (two trombones, bass trombone, and tuba), she does not neglect the rest of the ensemble. At times, trumpets are brought in as reinforcements, yielding a brass-choir cushiness that is a sometimes overlooked aspect of this orchestra's special sound tradition. It's when one starts listening for pure inspiration, rather than the sense that the piece has a job to do, that the work begins to seem less important. The big-shoulder aspect of this instrumental sub-species comes across. It has superb forces to realize it — trombonists Nitzan Haroz and Matthew Vaughn, Blair Bollinger on bass trombone, and tubist Carol Jantsch. The orchestra led by Cristian Macelaru had the job well in hand. 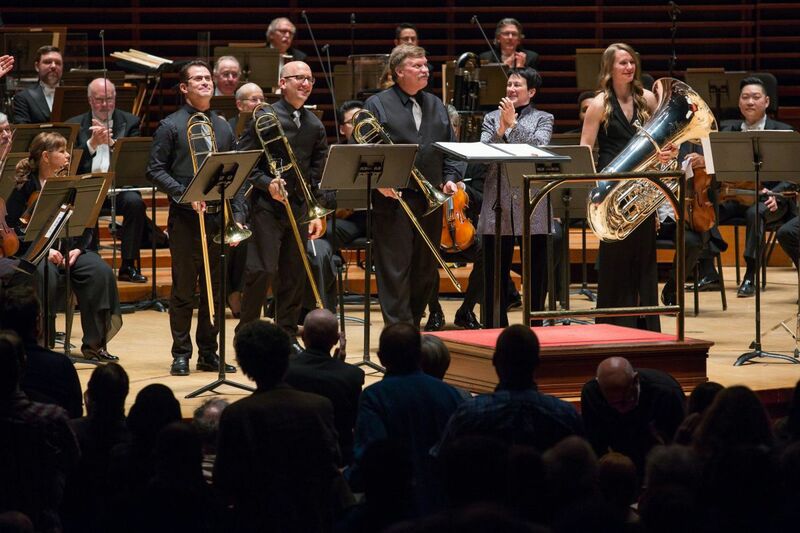 Trombonist Nitzan Haroz, trombonist Matthew Vaughn, conductor Cristian Macelaru, Blair Bollinger on bass trombone, and tubist Carol Jantsch, perform Low Brass Concerto by Philadelphian Jennifer Higdon, at the Kimmel Center, Saturday, February 24, 2018. But the piece, for all its energy and fine crafting, largely left me cold. It was presented in the larger context of dance, elements of which are found in Beethoven's Symphony No. 8. Macelaru took a moderate view of tempos. It was not an occasion for expansive statements from the podium, but one that allowed the music to speak for itself. The conductor curated five Brahms Hungarian Dances — not the ones you might know best, but Nos. 2, 4, 8, 16, and 10 (performed in that order). Overt schmaltz was at the core of one or two of them, which is what we generally expect. But elsewhere, in the No. 16 in F Minor, for instance, in an orchestration by Albert Parlow, rich harmonic tugs and dashes in tempo made you understand the soulful appeal of this folk language to Brahms. It's always fun to listen for which elements of the music seem to spring from the people, and where the signature of Brahms reveals itself. The most powerful statement of the program was in Macelaru's feeling for Kodály's Dances of Marosszék. For one thing, it's gorgeously orchestrated — smartly spare in places to let resonances bloom, which they did. The conductor used rubato to great effect, which only sharpened the sense that this was music stirring so urgently within the composer that putting it on paper was only an act of taking dictation from pure inspiration. Additional performance at 8 p.m. Saturday, Verizon Hall, Broad and Spruce Streets. Tickets are $10-$153. Information: 215-893-1999 or philorch.org.